Tamlyn Tomita. Arden Cho. Sword Fight. Badass. Have you been watching MTV's Teen Wolf? In addition to a lot of young pretty people and dark, shadowy happenings, the hit supernatural drama features one of television's few Asian American families. The cast includes Arden Cho as Kira Yukimura, a foxy (literally) lady, and Tamlyn Tomita and Tom Choi as her parents. 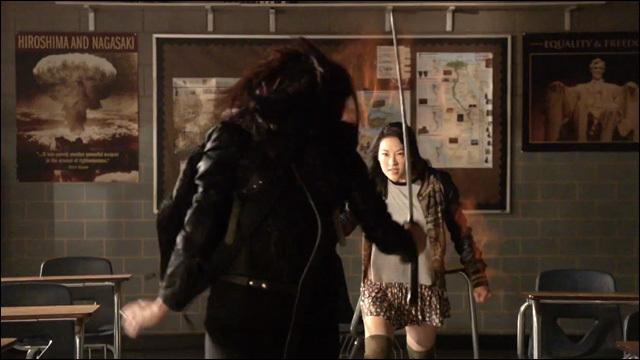 In this sneak peek clip from next week's episode, Kira and her mom engage in a sword fight that nearly goes wrong. Don't ask me why mom and daughter are suddenly dueling in the middle of a high school classroom -- I'm not actually caught up with the current season, so I have no idea what's going on. But it's badass. It's Arden Cho versus Tamlyn Tomita, swinging sharp blades at each other. That's all you need to know. You're welcome, fanboys and fangirls. Teen Wolf airs Monday nights, 10/9c on MTV. Also: Listen to my podcast conversation with Tamlyn Tomita on Sound and Fury.